Hi everyone! Happy Friday to you! This was the first full week of school for us and it sure felt like a loooooong week. I am looking forward to the weekend for some downtime. With the kids at school, I have had my days open to create and catch up with my business. It feels amazing! After the week of stamping, I had a pile of scrap bits of paper laying in a pile beside my Big Shot and Stampin' Trimmer. (I have to admit this is one of my worst bad crafting habits. The scrap pile is huge and never organized). Anyway, the TGIF Challenge TGIFC73 was the perfect use for all of these scraps. I used this color combo on the blog Monday. The word "love" was the negative left over from the card. How many times do you throw these away? And they could have made a cute card! I gently sponged around the word "love" to give some texture. The card came together very quickly and was the prefect use for all of those bits of paper. I am excited to see what this challenge brings. The TGIF Design Team is sharing project ideas on the TGIF Blog ... click over to be inspired to use your negative scraps. 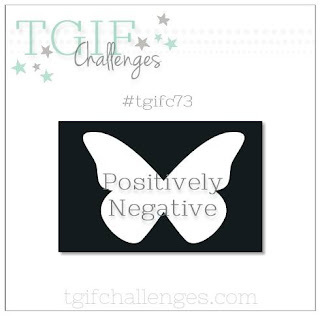 You are invited to play along and share your creations with #TGIFC73. Read more over at TGIF. Have a great weekend everyone and I will see you on Monday!